Whether you’re sleeping in a strange position or have a stuffy nose, we all snore from time to time. Snoring is a common problem among people of all ages and genders, and it affects roughly 90 million Americans. Of those 90 million, about 37 million experience snoring on a regular basis. Though snoring may seem harmless, it can lead to problems such as poor sleep quality or disrupted sleep for your partner. Poor sleep at night then translates to daytime sleepiness which can cause difficulty with concentration, poor memory, and an increased risk for accidents. Even serious health problems like heart disease are casually linked to snoring. n this article, we’ll review the basics about snoring including what it is, the symptoms, and what causes it. We’ll also talk about diagnosis and treatment options. 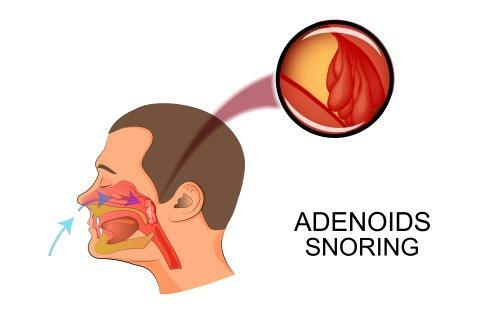 Snoring is a harsh or hoarse sound that occurs when air flows past relaxed tissues inside the throat. As the air flows past these tissues, it causes them to vibrate which creates the sound you know as snoring. 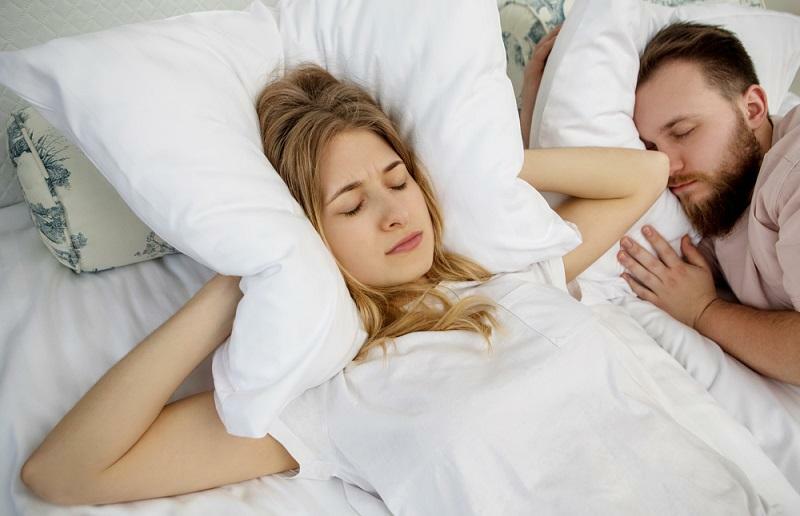 Most people snore once in a while but, for some, it is a frequent occurrence. In some cases, chronic snoring may even be an indicator for a serious health problem. Though chronic snoring can sometimes be a condition in and of itself, it is often correlated with another sleep disorder –sleep apnea. Sleep apnea is a disorder characterized by periodic pauses in breathing during sleep which can be followed by gasping or choking sounds. Obstructive sleep apnea is the most common form of the disorder, caused by a collapsed or blocked airway – it can also happen when the tongue relaxes into the airway to form a partial or complete blockage. Sleep apnea is a condition characterized by abnormally low breathing and pauses in breathing while snoring is a vibration caused by obstructed airflow. Though the two conditions are different, they are closely linked – many of the factors that increase your risk for snoring also increase your risk for sleep apnea such as obesity, age, and certain anatomical abnormalities. Snoring can affect people of all ages, though it is more common in men than in women. Roughly 50% of people snore at some point in their lives, though having a family history of snoring may increase your risk. The risk of snoring seems to increase with age with about 40% of men and 24% of women being habitual snorers for an extended period of time. Interestingly, however, a man’s likelihood of snoring decreases after the age of 70. In many cases, snoring is a symptom of sleep apnea – particularly obstructive sleep apnea. Obstructive sleep apnea often presents with loud snoring punctuated by periods of silence when you stop breathing. During each pause, your oxygen levels decline which triggers the brain to wake up and restart your breathing – this is when you experience gasping or choking as your body resumes breathing. Again, factors such as obesity, narrow airway, and a family history of snoring or sleep apnea can increase your risk for both conditions. The ultimate cause of snoring is vibrating tissues in the throat which cause noisy breathing during sleep. The factors that contribute to this vibration, however, are many. For some people, the underlying cause of snoring is simply a matter of anatomy. If you have a low, thick, soft palate, it can cause your airway to be narrower than is normal. People who are overweight or obese may have extra tissues in the back of the throat that makes the airway narrow. Other anatomical features such as large tonsils or adenoids and an elongated uvula can also cause a partial blockage. The narrower or blocked your airway becomes, the more forceful the flow of air becomes which increases tissue vibration, causing your snoring to become even louder. Age – Snoring can affect people of all ages, but your risk increases with age because the airway becomes narrower as you get older. Muscle tone in the throat also decreases with age. Obesity – Being overweight or obese is a common cause. Excess weight may contribute to excess tissue in the back of the throat and a wider neck which can put pressure on the airway. Poor physical fitness – Low physical fitness may cause poor muscle tone in the throat which may make it easier for the soft palate and other tissues to relax into the airway. Nasal/sinus issues – Having a stuffy nose or blocked airway can make inhalation more difficult, creating a sort of vacuum in the throat which may lead to snoring. Medications – Taking certain medications like tranquilizers may increase muscle relaxation and cause more snoring – examples include Valium (diazepam) and Ativan (lorazepam). Smoking – Tobacco use may increase muscle relaxation and make snoring worse. Sleep posture – Sleeping in certain positions may contribute to muscle relaxation in the neck which can create blockages in the airway. Lying flat on your back seems to be worst. Not only are there many potential causes for snoring, but there are a number of factors which may increase your risk. Being male – Men are more likely both to snore and to have sleep apnea than women. Obesity – Being overweight or obese increase your risk for both snoring and obstructive sleep apnea – particularly if your neck circumference is more than 16 inches for women or 17 for men. Narrow airway – If your airway is narrow, it is more likely to become blocked as you breathe at night when the soft palate or tongue relaxes. Having large tonsils may contribute as well. Alcohol consumption – Drinking alcohol causes your throat muscles to relax, increasing the risk of snoring during the night. Nasal problems – If you have a cold with nasal congestion, your risk of snoring may be higher. Certain anatomical abnormalities such as deviated septum may cause chronic nasal congestion which could increase your risk for chronic snoring. Family history – Having an immediate family member who snores and/or has obstructive sleep apnea can increase your risk for both. Occasional snoring may only be a minor nuisance. For the snorer, it can lead to poor sleep and daytime drowsiness and, for your partner, interrupted sleep with similar daytime consequences. When snoring becomes a frequent and severe problem, however, it is best to see your doctor to determine and treat the underlying cause of the problem. If you’re concerned about your snoring, talk to your doctor. Your doctor will review your symptoms as well as your medical and family history to determine the potential underlying cause for your snoring and to make treatment recommendations. A physical exam will help rule out anatomical causes for snoring and imaging studies may help as well. In many cases, your doctor will want to perform a sleep study – particularly if your snoring is severe and happens frequently. You may also be asked to keep a sleep journal to track your sleep habits as well as your symptoms. The data from all of these tests should help your doctor make an accurate diagnosis at which point he will be able to make recommendations for treatment. In order to correctly treat the underlying cause of your snoring, your doctor needs to be able to identify that cause. Open-mouth snoring – Most likely related to tissues in the throat. Closed-mouth snoring – Typically a problem with the tongue. Snoring while sleeping on the back – May be improved by lifestyle changes and better sleep habits – generally seen in cases of mild snoring. Snoring in all sleep positions – Often seen in severe cases of snoring – may require more comprehensive treatment than other types. Even if you don’t have a partner who is bothered by your snoring, it is still a good idea to treat the problem. Left untreated, chronic snoring can lead to daytime fatigue, difficulty concentrating, impaired performance at work or school, irritability and mood swings, high blood pressure, and a higher risk for heart disease and stroke. Fortunately, there are a number of treatment options available. In many cases, people who snore are unaware of the fact that they do so. If you don’t know that you snore, you’re unlikely to seek treatment. If you experience symptoms such as daytime sleepiness, difficulty concentrating, or irritability it could be an indication of sleep disturbance and chronic snoring could very well be the cause. When it comes to treating snoring, treatment options vary depending on the underlying cause. Continuous positive airway pressure (CPAP) – Often used as a treatment for sleep apnea, CPAP involves wearing a mask over the nose and mouth during sleep. The mask is hooked up to a machine that creates gentle pressure through airflow to keep the airway open during sleep. Oral appliances – Form-fitting dental mouthpieces can reduce snoring by altering the position of your jaw, tongue, and/or soft palate. Some devices pull the lower jaw forward to open the airway while others keep the tongue and soft palate from collapsing into the airway. 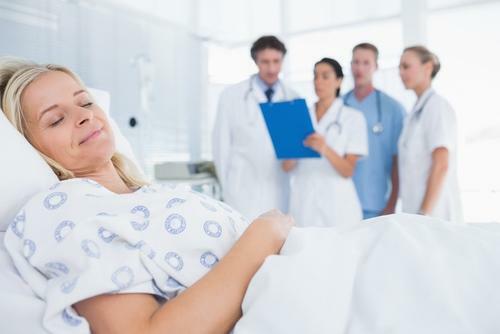 Surgical correction – In severe cases, surgery can be performed to open the airway by removing excess tissue from the throat or by moving the upper and lower jaws forward. Positional therapy – Changing the position in which you sleep can reduce snoring, particularly if you tend to snore most when sleeping on your back. Try sleeping on your side instead. Weight loss – Losing weight can reduce or eliminate your snoring, particularly if you are severely overweight or obese – it also reduces your risk for sleep apnea. Quitting smoking – Smoking can increase your risk for snoring, so quitting may help resolve it. Regular exercise – Exercising regularly can help you lose weight which, in turn, may reduce your snoring. Regular exercise is also beneficial because it helps tone your muscles, including the muscles in your throat, which may reduce snoring as well. In addition to these treatments, there are certain exercises which may help strengthen the muscles in your airway to reduce the risk of snoring. One exercise is to repeat each of the five vowel sounds outline for three minutes several times a day. Another is to hold your mouth closed with pursed lips for 30 seconds or to place the tip of your tongue behind your top front teeth and repeatedly slide the tongue backward and forward for three minutes a day. Even the act of singing out loud can build muscle and improve muscle control in the throat. Out of all the treatment options, lifestyle changes are the most effective when it comes to long-term relief from snoring. Making changes to your habits to lose weight and improve bad habits will not only reduce your snoring, but it will improve your health overall as well which decreases your risk for other sleep disorders and chronic diseases.